ABOUT US - JIM WROBLESKI & CO., INC.
Our company has received over 100 achievement awards from manufacturers including top sales volume awards, most improved sales awards, representative company of the year awards and salesperson of the year awards. 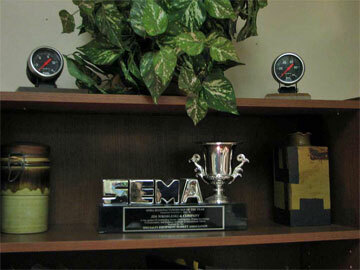 Industry Recognition – 2001 SEMA Manufacturers Rep of the Year. Jim Wrobleski, Sr. was elected the 2nd recipient of the SEMA Manufacturers Rep Council Hall of Fame Award in 2007. In July 2007, Dave was installed on the SEMA Board of Directors, for a three year term. Dave also has completed all of the requirements for the Professional Manufacturers Representative program at Arizona State University. He has been awarded by the Board of Governors of the Institute for Professional Advancement, the educational subsidiary of the Manufacturers Representatives Educational Research Foundation, the designation of Certified Professional Manufacturers Representative. Active members of SEMA, AAIA & PWA and we participate in all important industry events and shows to ensure that we are the most effective, well rounded and knowledgeable rep firm in the aftermarket. Trace Walls, Kirk Tenney have all earned the Certified Sales Professional (CSP) designation. To earn the CSP designation these gentlemen were required to have over two years of sales experience, pass a written examination and a one-on-one verbal exam. Continuing education is also required for continued certification. The commitment to ongoing professional development will be recognized by customers, with a reputation for being efficient, reliable and professional salespeople. We travel four (4) full-time salesmen with over 100 years of combined industry experience. COPYRIGHT © 2009 - 2019 JIM WROBLESKI & CO., INC.